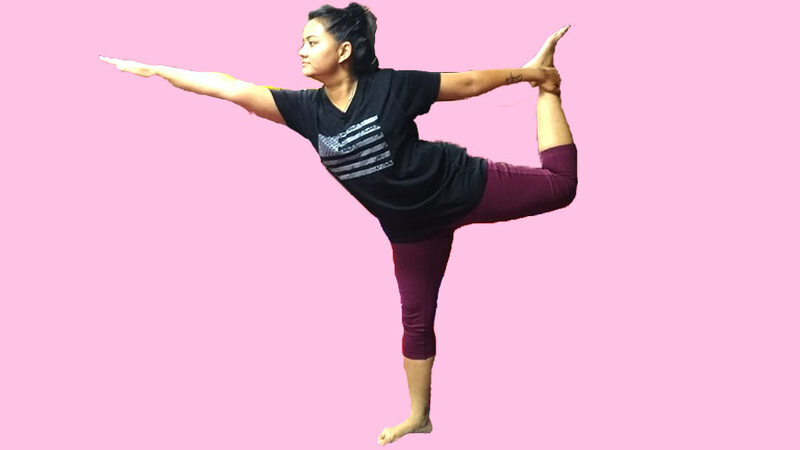 Natarajasana (नटराजासन – Natrajasana in Hindi) is also known as Lord of the Dance Pose. Nataraja is the name of Lord Siva, the Hindu God, who simultaneously creates and destroys the world, in his role as lord of the dance and his dance symbolizes cosmic energy. Sanskrit name Natarajasana is derived from 3 words, viz. “Nata” means dance, “Raja” means king and “Asana” means posture, and hence the name Natarajasana – Lord of the Dance Pose. Natarajasana is a balancing asana and as such, induces physical and nervous balance. The focus required to perform this asana helps develop concentration. A coordination at the emotional, mental and physical level is achieved which helps remove stress and anxiety. Spread a Yoga Mat and stand straight on it with your arms by your sides. Bend your left leg backward and reach out to grasp your left ankle with your left hand behind the body. Keep both your knees together and try to maintain the balance. Slowly stretch and raise your left leg backward as high as you can and is comfortable to you. Care should be taken to not to let the left hip twist and also ensure that your left leg is raised directly behind the body. Extend your right arm forward in front. Focus your gaze on the right hand. Hold this posture as long as is comfortable and keep breathing normally. Now slowly come back to starting position. Repeat the same procedure with the right leg. You can practice up to 3 times on each side. Natrajasana strengthens back, shoulders, arms, legs, and hips. This asana provides a nice stretch to the thighs, groin, and abdominal organs. The Lord of the dance Pose helps develop a sense of balance and coordination in the body. Natrajasana is very good for Improving concentration. The practice of this asana releases stress and calm the mind. People suffering from High blood pressure and back problems should not practice Natarajasana. 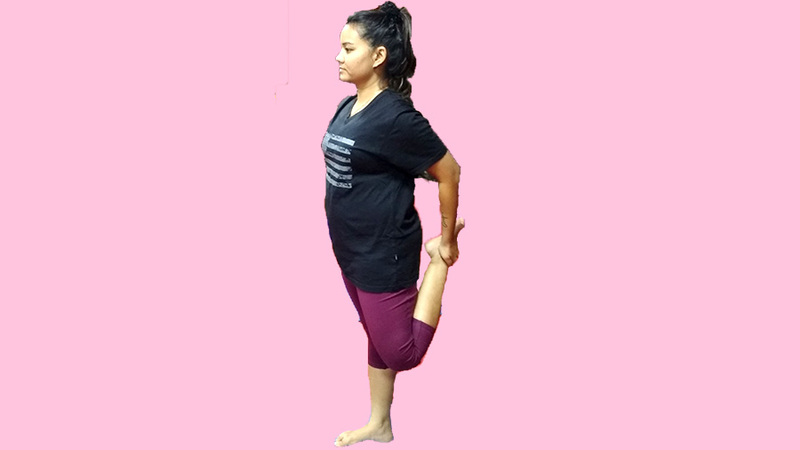 People suffering from a weak heart, hernia, colitis, duodenal ulcer and vertigo should not practice this asana. Do not to twist your hip while stretching and raising the leg backward. It should be raised in the backward direction only. Balancing in Natarajasana may be difficult in beginning. Start the practice slowly and gently. Fixing the gaze at the raised hand will help you maintain the balance. You can also take the support of a wall initially. For the advanced Yoga Pose of Natarajasana, once you are comfortable holding the pose as above, try to hold the big toes with both the hands. For more advanced pose of this asana, you can try to touch the sole of your foot to the back of your head.